The Fog of War is a common type of game data visualization, frequently used in Real Time Strategy (RTS) games. At the core, the idea is simple: areas on the map where you control units (or have explored) are visible, and unexplored areas are dark. This post describes a simple way to achieve this effect for a browser based game using SVG filters and masks, along with a little bit of D3.js. Filters can be not only a powerful prototyping tool, but also an easy way to achieve impressive visual effects for browser based games. Note: Filters are not supported in all browsers. If using filters in production, be sure to be aware of the performance tradeoffs and the browsers your audience uses. View demo. Because any SVG element can be placed in a mask, we can dynamically add and remove elements from a mask. We can transition property values, allowing the mask to fade in. We can also place elements with gradients or patterns in an element in the mask tag. And, if we want to make a fog of war effect, we can use filters. To me, this filter reminds me of a torn map. Filters can be applied as properties to elements (like rect, circle, and path), which means we can apply filters to elements that are in a mask. 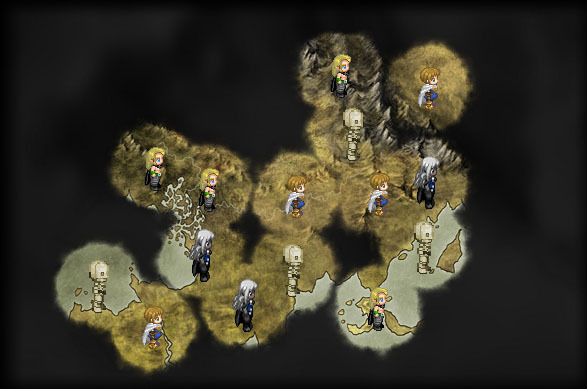 The fog of war is a common form of data visualization in games. Using d3.js and SVG filters to create a fog of war effect for browser based games is not only easy, it provides great flexibility and power. Click the map to reveal fog. Using filters to create the fog of war data visualization effect used in games. However, the tradeoff is often at the cost of performance. In the example, you likely noticed that performance hits are noticable even after a relatively small amount of elements to the mask. While this is just an unoptimized demo, using complex SVG filters can be a large bottleneck. One other area that could be optimized is the filter itself. A simplier filter is more efficient, as less processing has to be done to fewer pixels. If you were developing an RTS game where the fog of war was constantly changing, this method is likely a bad fit. For games that need only a small number of elements masked, like a rogue-like map exploration HTML5 game I'm building, the tradeoff is acceptable. With tradeoffs in mind, and depending on your application, using SVG filters in browser based games can be great. Even if the performance isn't acceptable for your use case though, filters can serve as a powerful prototyping tool. Happy filtering, now go filter yourself! 2913 subscribers. The only emails you'll ever see from me are when I publish a new article.